Insulin helps patients with Type 2 diabetes regulate their blood sugar, but the treatment is also associated with weight gain—an unwanted and unhealthy side effect. To address that problem, scientists at the University at Buffalo and California Institute for Biomedical Research (Calibr) in La Jolla, California, are working to develop a therapy that could enable patients to control glucose levels while also losing weight. The treatment the researchers are developing is based on oxyntomodulin, a hormone that performs two important biological functions: First, it helps to keep glucose levels low by helping to increase insulin production. Second, the hormone encourages weight loss in part by facilitating processes that reduce food intake and increase the body's expenditure of energy. "On its own, oxyntomodulin has a short half-life. It's broken down quickly in the body, which means that patients would need to take it often and use high doses for it to work as a pharmaceutical," says Qing Lin, a chemistry professor in UB's College of Arts and Sciences. "We've modified the hormone's structure in a way that enhances its potency and enables it to survive in the body for longer periods of time, which allows for less frequent and more effective dosing." 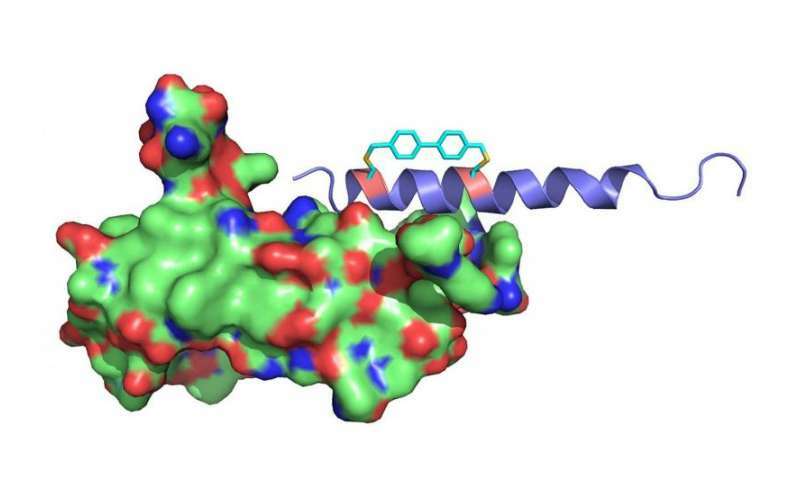 On Jan. 4 in ACS Chemical Biology, the researchers report that they have created several new versions of oxyntomodulin, including two that decreased blood glucose levels considerably in mice. Mice that received one of the two new compounds after ingesting glucose saw their glucose levels fall by 40 to 45 percent more than mice that received a placebo treatment. The two compounds also survived longer inside the animals than oxyntomodulin as it's found in nature. Lin was a senior author on the paper, along with Weijun Shen at Calibr. Lin has founded a startup, Transira Therapeutics, to further explore the potential therapy. In the body, oxyntomodulin regulates glucose levels and facilitates weight loss by binding to and activating two cellular receptors: the glucagon receptor (GCGR) and the glucagon-like peptide-1 receptor (GLP-1R). Oxyntomodulin performs its job best when it's in a certain helix conformation, but like many other peptide hormones, oxyntomodulin usually shifts between different shapes, including various helices and a random coil. Lin and his colleagues use a clever chemistry trick to help oxyntomodulin keep its helical shape. Their patented method is called chemical cross-linking. It involves engineering an oxyntomodulin molecule to include two groups of chemicals containing an amino acid called cysteine on different parts of the molecule, and then using a chemical linker to fasten those two groups together to make the molecule rigid. In cultured cells, cross-linked oxyntomodulin molecules were extremely effective in activating GCGR and GLP-1R, Lin and his colleagues reported in ACS Chemical Biology. The helical molecules are also harder for enzymes to break down, which helps the molecules survive longer in the body.